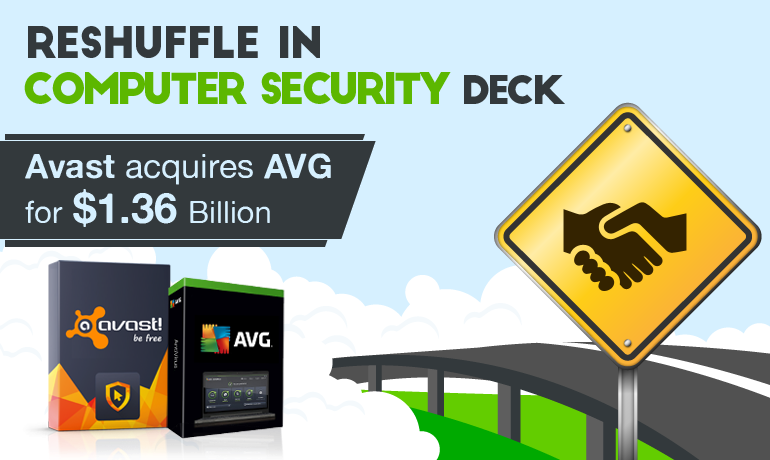 Avast Acquires AVG for $1.3 Billion and reshuffles the computer security deck! It has recently been announced that Security giant Avast has acquired fellow Czech-based antivirus software maker AVG for a whooping total of around $1.3 Bn. Started 25 years ago in Prague, Avast Software is the maker of mobile and PC security in the world and provides protection to more than 230 million people and businesses with their security applications. With a market share of more than a fifth of the global antivirus software market, they have been ranked at the top several times by the consumers on popular download portals worldwide, and are also among the ones to be certified by VB100, AV-Comparatives, AV-Test, OPSWAT, ICSA Labs, and West Coast Labs, as well. Founded in the early 90s, the NYSE listed AVG is again one of the leading providers of software services to secure devices, data and people. Their portfolio includes services and products for mobile devices and desktops such as internet security, performance optimization, location services, data controls and insights, and privacy and identity protection, along with cloud security and remote monitoring and management (RMM) solutions for the Business clients, as well. Evidently, the computer security space is largely dominated by a handful of major players! And when two of the biggest of them decide to team up, it becomes certain that it would send ripple effects across the freeware, desktop & mobile antivirus software, and business security suite industries, and will majorly re-shuffle the security software deck, as well. The two parties have entered into a purchase agreement in which Avast buy all of the outstanding ordinary shares of AVG for $25 per share in cash. Avast would be financing the acquisition partly by using the cash balances it holds, along with committed debt financing from third party lenders. The proposed transaction is not subject to a financing condition. In fact, Avast has already received a financing commitment of $1.685 Bn from Credit Suisse Securities, Jefferies International Limited and UBS Investment Bank, collectively. Additionally, they (Avast) personally have also contributed $150 Mn in equity investment to fund the transaction as well. During the course of the deal, Jefferies International Limited was their exclusive Financial Advisor, and “White & Case LLP” and “De Brauw Blackstone Westbroek N.V.” were their Legal Advisors. While on the other end, “Morgan Stanley & Co. LLC” was the Financial Advisor, and “Orrick, Herrington & Sutcliffe LLP” and “Allen & Overy LLP” were the Legal Advisors to AVG. “Bridge Street Securities LLC” acted as the independent financial advisors to the supervisory board of AVG. A recent data from software-maker OPSWAT points out that Avast’s 15% market share along with AVG’s 5% would surpass Microsoft’s 15.9% market share, making the combined company the biggest antivirus software firm by number of active users, in the world. The deal will give Avast access to more than 400 million devices that currently use Avast or AVG’s software, which includes 250 million PC and Mac users, and 160 million mobile users. This increase in scale will help Avast to create more technically advanced personal security and privacy products, and will also give Avast access to AVG’s Zen mobile technology for controlling the protection of all a family’s devices. Clearing the air, Avast also confirmed that the AVG brand will not be disappearing, and in fact, they would be using a combination of the two brands owing to associated strengths in different markets. This transaction has been unanimously approved by the Management Board and Supervisory Board of both the companies, and has recommended the offer for acceptance to the AVG shareholders. Although, they haven’t started planning about the team integration yet, but in the coming few months, one of the first tasks for them would be to analyze and plan the organization. And there would also be some staff reductions, given that there would be duplication of several roles. The transaction is expected to close before October 2016, depending on the time taken by regulatory review. Why did this Acquisition take place? To begin with – the computer security market has seen to be entering the consolidation phase! This deal comes less than a month after antivirus pioneer Symantec Corporation acquired Cyber-Defense vendor Blue Coat Systems Inc for $4.65 Billion. Now, coming to the topic of discussion; quite honestly, the real objective of the acquisition of AVG was long time plans! The security industry is maturing; the PC space, to be specific. And with time, scalability would become very important for companies, which would eventually lead to consolidation. So Avast wanted to be one of the early adopters of the change, and become one of the larger players in the industry. Basically, the deal is aimed at acquiring long term scale and geographical breadth, and transform into a company that not only builds out its security offerings that serve existing customers with “more advanced” products, but also has a firm eye on emerging growth opportunities such as in the Internet of Things (a name used to refer to the network connecting physical devices, ranging from fridges to cars and clothes, to the internet). And since Internet of Things (IoT), is widely known to be a security nightmare for consumers, it has opened up a wide range of opportunities for the experienced security players to step in and address the issues. So with the technological depth and geographical breadth that the new organization will attain, it would be in a much better position to take advantage of emerging growth opportunities in all such areas. As the definition of online security has seen to be drastically shifting from being device-centric, to being concerned with devices, data and people, this deal is definitely going to turn out to be equally (if not more) beneficial for AVG as well! Joining hands with Avast gives them the leverage to accelerate investments in growing markets and continue to focus on offering wide-ranging and simple-to-use solutions for consumers and businesses. To sum it up – what you see happening here is, a number of old companies trying to find ways to consolidate and buy new technologies and get access to growth in new markets, to maintain their superiority in them market. In fact industry players are expecting more such deals to take place, in the near future! The first thought that crossed many people’s mind is that, do antivirus companies matter anymore? I mean, $1.3 Billion is a lot of money, for a company, in an industry that is slowly fading away. Presumably, of course! But turns out – they do. More than you know! But when you look closely, the picture is very different. They are no more just, antivirus companies, and have transitioned from the PC space to devices. In fact, they’ve turned into larger, security solutions companies. We can’t predict human behaviour. We don’t know for sure, when we as users would expose ourselves to vulnerabilities. With the changing times, everyone and everything but evolve. If they don’t, they tend to fade away! Every company needs new customers and access to new markets, and this is a step taken by Avast in that direction. In this context – many giant companies are betting on Internet of Things to take the world by storm. So instead of fighting with each other, Avast and AVG decided to team up. Take for instance – the acquisition of MacAfee by Intel. They did so to get ahead in the IoT space. And when companies like Intel, bank heavily on something, the Internet of things, then you can be sure tee a lot more action in the industry. Yes, indeed it would have made more sense for AVG to buy Avast, given that they AVG has a better revenues, staffing and is more valuable than Avast; but overall, Avast is much better when it comes to their growth, sustainability, higher valuation and are publically traded. Nevertheless – looking at the acquisition, it seems like a natural industry consolidation, along with an effort to exist rather than highlighting the importance of antivirus programs.